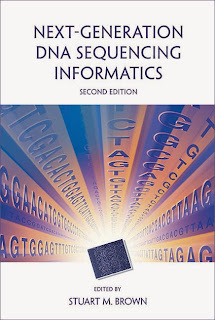 The second edition of the Next-Generation Sequencing Informatics book (that I edit) is at the printer and available for pre-order at Cold Spring Harbor Press and Amazon. We think it will ship on June 30th, maybe a bit sooner. We have added new chapters on the latest sequencing technology, QC, de novo transcript assembly, proteogenomics and lots of updates and expansion in areas such as RNA-seq and ChIP-seq. It has a beautiful cover and its not too expensive. Next-generation DNA sequencing (NGS) technology has revolutionized biomedical research, making genome and RNA sequencing an affordable and frequently used tool for a wide variety of research applications including variant (mutation) discovery, gene expression, transcription factor analysis, metagenomics, and epigenetics. Bioinformatics methods to support DNA sequencing have become and remain a critical bottleneck for many researchers and organizations wishing to make use of NGS technology. 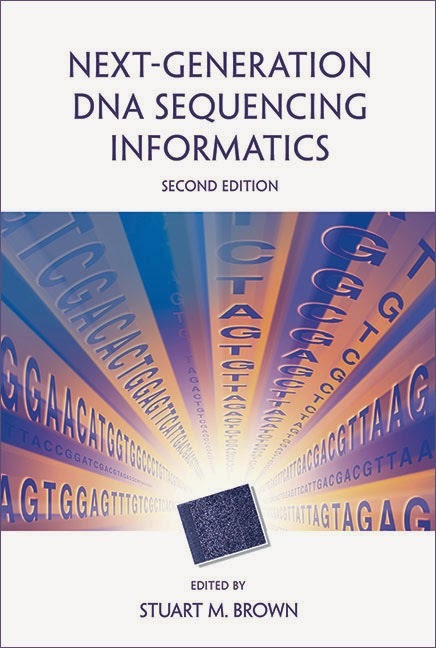 Next-Generation DNA Sequencing Bioinformatics, Second edition, provides thorough, plain language introduction to the necessary informatics methods and tools for analyzing NGS data as did the first edition, and provides detailed descriptions of algorithms, strengths and weaknesses of specific tools, pitfalls and alternative methods. Four new chapters in this edition cover: experimental design, sample preparation, and quality assessment of NGS data; Public databases for DNA Sequencing data; De novo transcript assembly; proteogenomics; and emerging sequencing technologies. The remaining chapters from the first edition have been updated with the latest information. This book also provides extensive reference to best-practice bioinformatics methods for NGS applications and tutorials for common workflows. The second edition of Next-Generation DNA Sequencing Bioinformatics addresses the informatics needs of students, laboratory scientists, and computing specialists who wish to take advantage of the explosion of research opportunities offered by new DNA sequencing technologies.